Perfect little gift for any occasion! One 3.5-4 inch succulent in a little gift box - Arrives ready to gift and you can select the ribbon color, see picture 2 for options. 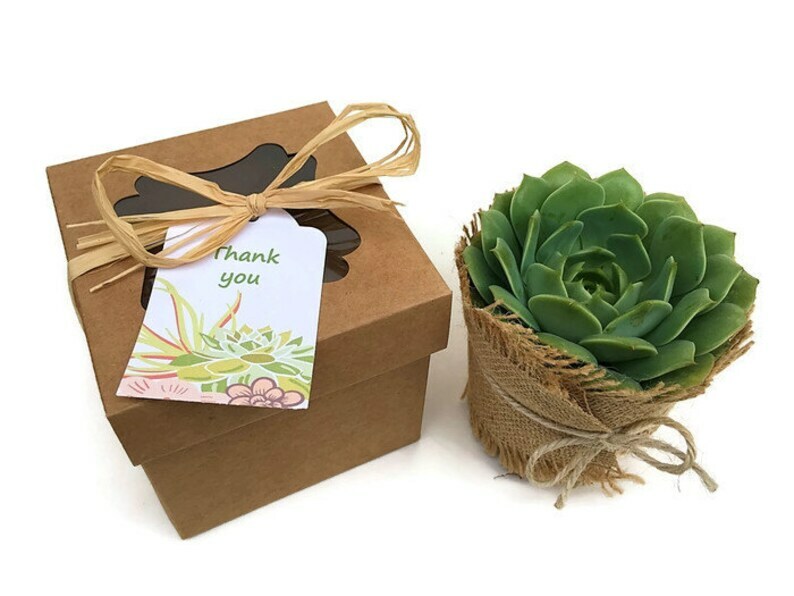 - 1 assembled Kraft gift box (size of each box is 4"x4"x4") with 1 well-established, high quality rooted succulent (Echeveria) potted in approx. 3.5" nursery container. Succulent variety will vary based on availability, we always select beauties. Great communication on shipping details. Receiver of gift loved it! Thank you. Second time using this as a gift and the receiver loved it! She even took a pic. I was so satisfied with the presentation. The succulent was vibrant and the packaging was so adorable. The seller is super quick with responses to any questions and even accommodated me with my customized request. Will definitely continue to use these as a unique gift!